“Yayoi Kusama: Infinity Mirrors” is completing its nationwide tour at the High. Courtesy of Ota Fine Arts, Tokyo/Singapre and Victoria Miro, London.© Yayoi Kusama. 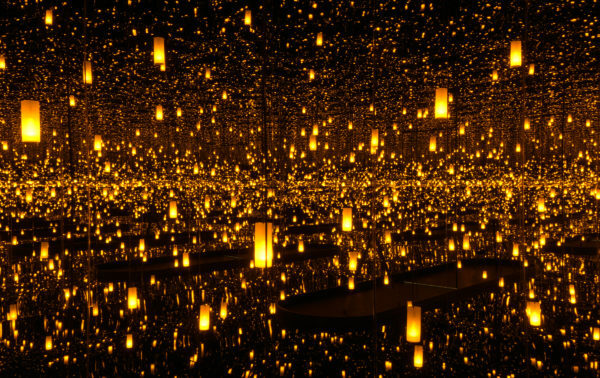 The exhibit, which has sold out at museums nationwide, features the work of an 89-year-old Japanese artist who is well-known for her Infinity Mirror Rooms and bright, dotted pumpkins. Atlanta will be the last stop of this popular tour. 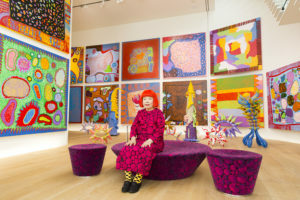 Yayoi Kusama with recent works in Tokyo, 2016. Courtesy of the artist. Art © Yayoi Kusama. Photo by Tomoaki Makino. Organized by the Hirshhorn Museum and Sculpture Garden in Washington, D.C., “Infinity Mirrors” will run at the High from Nov. 18 to Feb. 17, 2019. It explores 60 years of Kusama’s work, according to a press release. If you want to see Kusama’s bright, polka-dotted paintings, sculptures and infinity mirror installation at the High, you will need to reserve a time slot in advance. First, museum members can purchase tickets between Aug. 27 and Aug. 31, beginning at 10 a.m. every day. To be eligible, you must sign up to become a member by Aug. 17. Afterward, nonmembers can purchase tickets starting Sept. 17, beginning at 10 a.m. on the weekdays. The sale will go on until all tickets are sold out. All tickets must be purchased online through www.high.org. They cannot be refunded, exchanged or transferred. Member tickets for this exhibit are $14.50 for ages 6 and older and $5 for ages 5 and younger. General admission tickets, which will be sold starting Sept. 17, are $26 for ages 6 and older and $5 for ages 5 and younger. VIP tickets, which include a catalog for the exhibit, are $175. Tickets go on sale for members on Aug. 27 for ‘Infinity Mirrors’ Courtesy of Ota Fine Arts, Tokyo/Singapore; Victoria Miro, London; David Zwirner, New York.© Yayoi Kusama.